Normally, your lit. rat reviews a range of books solo, but today my canine-feline colleagues, Guido & Bonnie (@GuidoandBonnie), we’ll be helping me review today’s book roster, as our theme speaks to two topics near and dear to their hearts and mine, pet empowerment! Even pets have problems, but while humans have countless newspaper columns, call-in radio shows and daytime television programs, where can pets go for advice? One of the things I LOVE about Tabby is that she’s inclusive rather than exclusive. She doesn’t only advise her like species, but also birds, dogs, hamsters, and even trained Circus bears! She’ll also counsel the wilder critter folks, such as a lovelorn skunk who could be “Looney Tunes” alum, Pepe le Pew’s long lost distant cousin. 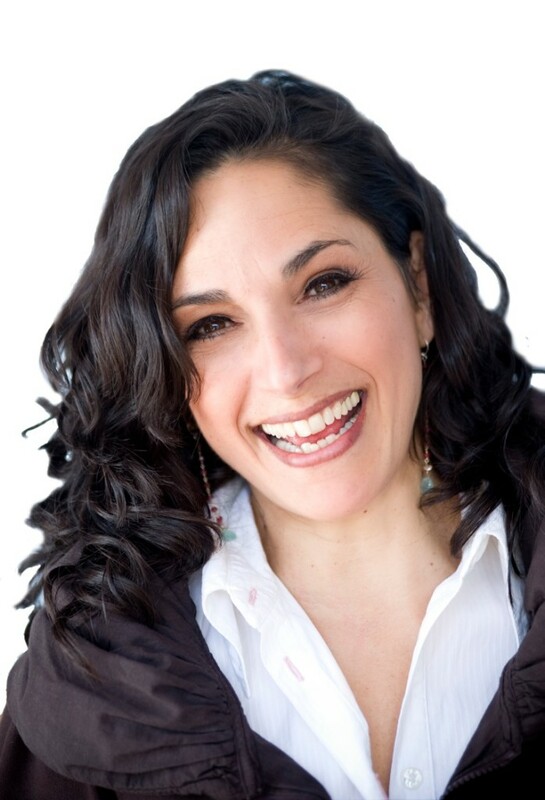 Author Carolyn Crimi nails the epistolary form. Each exchange between the animal inquirer and Tabby short and sweet with tons of personality. Illustrations by David Roberts have this hip and slick retro style that still feels contemporary, and in this era of digital communications, seeing the use of paper, pencils, and typewriters delights the nostalgia buff in me. I have to give a shout out to Katie Davis who through interviewing Carolyn for her podcast “Brain Burps About Books” I discovered Carolyn and her body of work, but in particular this book, which will be celebrating it’s 5th anniversary (or “Book Birthday” if you prefer) February 2015! I may be a dog, but unlike previous canine generations, I don’t subscribe to the conventions of cat and dog relations. 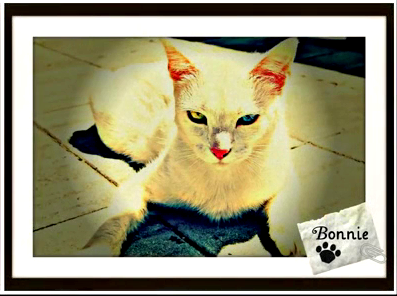 My best friend and confidant is Bonnie, who just happens to be a cat. Sure, there are some cats who rub me the wrong way, but it’s subjective, just like there are fellows and ladies my own species I don’t jive with. 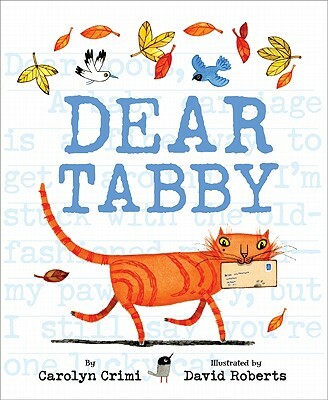 What I love best about “Dear Tabby” is that as Taurean mentioned in his review, Tabby’s inclusive, advising cats, dogs such as yours truly, and all the domestic and feral folks in between. 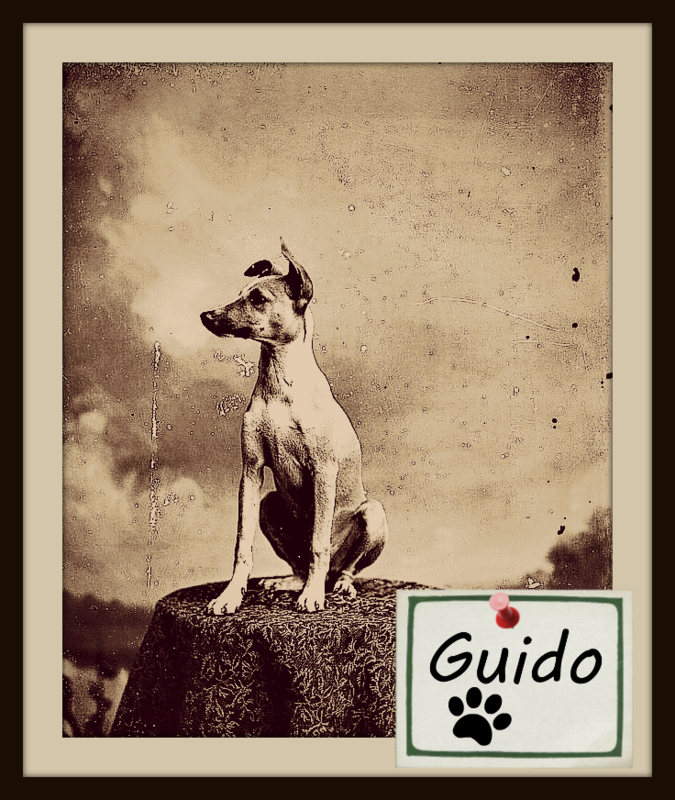 When Guido first proposed the idea of being in the pet empowerment/entertaining business, I thought he was just dreaming of the impossible. But Guido and Wendy (our fairy god-mouse, long story there…) convinced me to go for it, and this book (a favorite of my human, Andrea, in her pre-adolescent era) gave me the courage and sparked the passion in myself to do what Tabby does. While our methods are more high tech and global, versus Tabby’s network being analog and smaller scale, our goals are the same, to give pets a voice, and if possible, a little advice to aid their journey through this existence we call life. But Guido and I are taking it a step further to help pet parents get their pets a little better, and hopefully entertain them both along the way. Of all the countless “Out there” ideas Guido’s had (and still has) over the years, this I have to admit is his most brilliant yet. Thanks Guido, Wendy, and you, Dear Tabby, for inspiring me to take the first step into this challenging but fun and fulfilling life! Cats aren’t the only species in the “Pet Advice” business. Like his feline counterpart “Dear Tabby” Mr. Mutt gives dry wit and matter-of-fact tone to reply the the hounds, terriers, spaniels and mutts of all kinds who write him. Epistolary stories (i.e. Stories told entirely via letters) are tricky to pull off because just like in straight prose, each exchange has to pull its weight, and this book does just that. Unlike “Dear Tabby” that had a variety of pets and/or pet parent issues, all the letters to Mr. Mutt have two things in common, dogs with human issues, and all wonder why their cat roommates get better treatment, consideration, or otherwise special treatment from their humans they don’t. Another twist in “Mr. Mutt” is that his cat roomie, known only as “The Queen”, often hi-jacks his column to counterattack his jabs about cats. “Help Me, Mr. Mutt! Expert Answers for Dogs with People Problems” is a rough and tumble, tongue and cheek look at the world of pets advising pets. Though I do take issue with his narrow views on cats, but he’s from a different era, where cats and dogs had a lot of proverbial axes to grind toward each other. Or in the case of of the popular cartoons back then, axes were used in the literal sense! 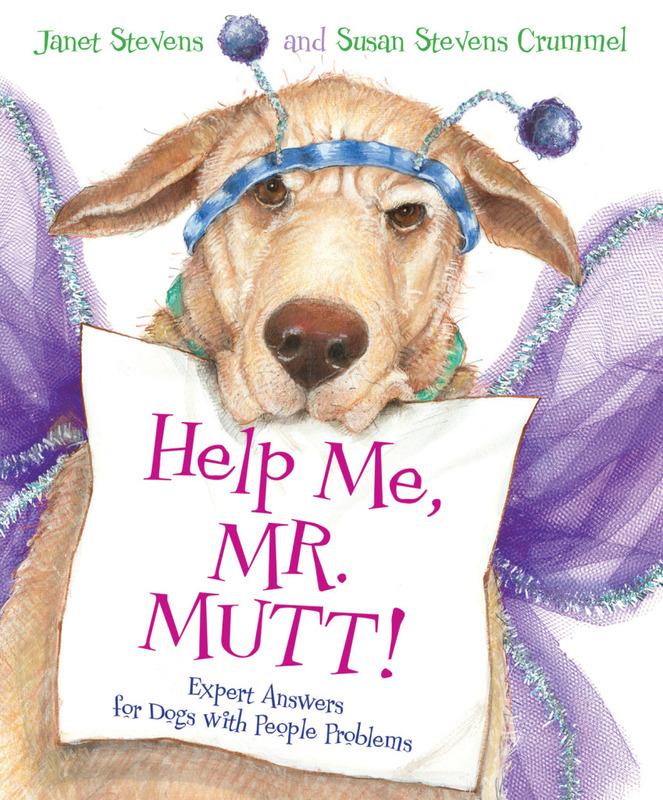 That aside, Mr. Mutt’s an okay dog in my book, and on my bookshelf. You might think I’d side with “The Queen” given she’s the main cat of this book, but you’d be wrong. Like Mr. Mutt himself, I’m not fond of her, either, it’s cats like her that give ALL cats a bad rep not only to dogs, but humans, too! Anyway, it’s books like this that remind me how lucky I am Guido and I can live/work in harmony, which doesn’t mean never fight, or get annoyed with each other, it’s just not a “War” every time. Emma is a dog with human problems. Most of the time, life with her human, George, is great, but as every pet (and pet parent) knows, there are days when the kibble hit the fan, and Emma’s overall a good dog, she makes her share of missteps, though George’s temperamental nature doesn’t help! Emma, both heartbroken and furious, finally decides it’s time to get some help, in the form of “Dear Queenie” a canine advice columnist who gives sassy and succinct counsel to pets at the end of their proverbial rope, and under the alias “Desperate Dog” Emma begins a string of correspondence between herself and Queenie that ultimately leads her to leave George’s home to the cat and be her own dog! Best known for her “Five Little Monkeys” series, author-illustrator Eileen Christelow brings us a funny and fast-paced tale that dog lovers everywhere will find as much truth as there is fiction. Inspired by the exploits of the “Original Emma” (the author’s dog who sadly died in 2013) Eileen’s frenetic yet warm illustrations reflect inviting yet quirky tones of the story, fans of “Martha Speaks” will definitely take to Emma’s direct and spunky voice. The use of the comic panel format (similar to “There’s A Wolf at the Door” that T.A.A. reviewed for Halloween 2014) adds a fun twist that is well executed. If you’ve got pups of your own, who are hard-pressed to read (or have read to them) anything in non-comic format, this book surely delight. As an author myself, I know there are often callous jokes in publishing about authors advised not write about their dogs, if Eileen heard this counsel, I’m SO GLAD she didn’t listen to them! 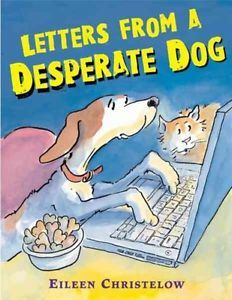 “Letters From A Desperate Dog” is like reading a “For Better Or Worse” comic strip from the dog’s POV. Big Words I know, but if the Patterson’s late canine friend, Farley, could read, this might’ve been his favorite book. After all, family issues are a two-way street, even between us and our furry friends. I also have to admit that like Emma, things between my master and me have rarely been smooth. The biggest is the matter of family vacations. Often Bonnie and I are left out and either stay home or at some daycare. I mean, I’m not a newborn pup, folks, I’m often the oldest dog there these days. While Bonnie did go on a car trip with Andrea (her human) to Canada to visit Bonnie’s sister Marjorie and her new kittens, the last time my master took me on vacation with him was over 9 years ago, and in dog years that’s nearly a century! Emma and George’s relationship reminds me a lot of my human Andrea’s relationship with her father , who’s Guido’s human, now that Andrea’s in the whirlwind of adolescence, she and her dad have many a battle over everything from clothes, food, to dating! Anyway, while I enjoyed “Letters From A Desperate Dog” I didn’t get as into it as Guido, but I appreciate the cat in it wasn’t “Evil” which is often how we feline gals and guys are portrayed in books from a dog’s POV. I was psyched that “Letters From A Desperate Dog” got a sequel and I can attest it’s just as great as the first! Emma, and her human, George have more or less worked out the strife they went through in the previous book, but peace doesn’t last long when George starts dating a woman that Emma suspects is up to no good. But Emma’s certain that Loretta (George’s girlfriend) is , and her dog, Hankie, even more-so. When her efforts to protect and warn George backfire BIG TIME, Emma once again writes to “Dear Queenie” canine advice columnist, under her alias, “Desperate Dog” in hopes finding a way to warn George of Loretta’s “True Colors” before it’s too late! Author-illustrator Eileen Christielow pulls out all the stops with this follow-up story. The use of comic panels shows a greater confidence in the overall presentation from both a artistic and functional standpoint. 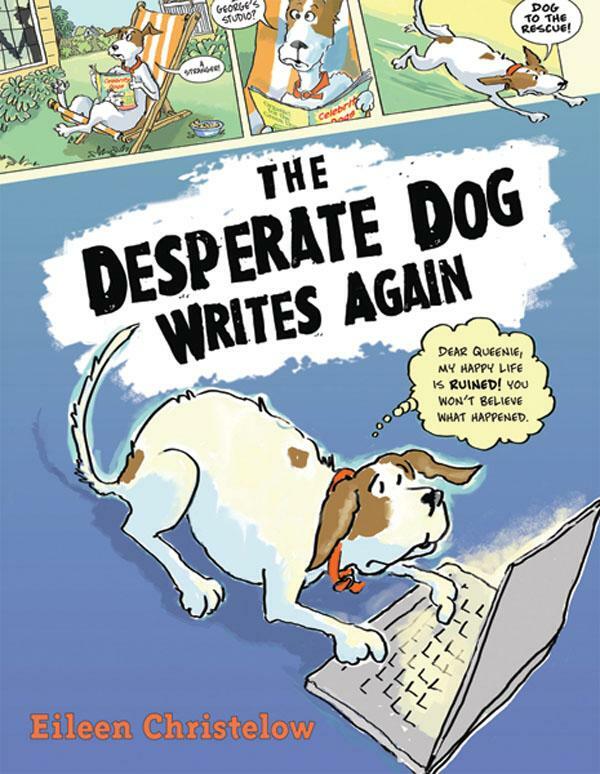 “The Desperate Dog Writes Again” is yet another love letter for pets and pet parents everywhere, and a humorous reminder that not all changes are bad, especially l when they involve PIZZA! Another great book about a “Desperate Dog” who’s anything but to me, and if I weren’t already in a relationship with a fine Irish Terrier (after YEARS being of single) I’d totally ask her out. That said, Emma, could you invite me and Bonnie over next time it’s Loretta’s pizza night? I got into the sequel much more in large part because the (unnamed) cat got more page time, and I love how his and Emma’s dynamics mirror mine and Guido’s.